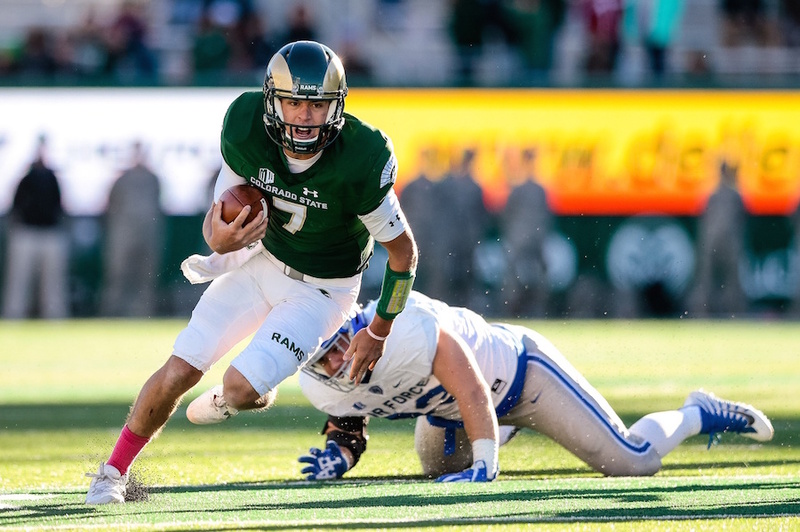 Four Colorado State football players have been voted first-team All-Mountain West, it was announced Wednesday by the league office. A total of 10 Rams received All-MW recognition including second-team and honorable mention selections. Offensive linemen Jake Bennett and Zack Golditch, wide receiver Michael Gallup and quarterback Nick Stevens are all first-team selections, while running back Dalyn Dawkins was named to the second team. Linebackers Evan Colorito and Josh Watson, tight end Dalton Fackrell, offensive lineman Trae Moxley and punter Ryan Stonehouse were included as honorable mention recipients. The four first-team selections are CSU’s most since 2014. The Rams have multiple offensive linemen on the first team for the first time since 2000. Bennett and Golditch anchor an offensive line that leads the 10th-ranked offense in the nation. Behind the senior duo, the Rams offense has produced 501 yards per game – a stat that leads the MW. CSU has only surrendered 0.67 sacks per game this season, a figure that ranks third in the FBS. Bennett has started all 12 games at center this year, while Golditch has started every game across several positions on the o-line. Bennett, a communication studies major, was a second-team all-conference selection last season. Golditch, who is double majoring in ethnic studies and sociology, is earning all-league honors for the first time. Gallup, a Biletnikoff Award finalist, has recorded 94 catches for 1,345 yards this season, leading the league in both categories. He was the first player in the FBS to reach the 1,000-receiving-yard plateau this year, and is one of just two players in the nation with multiple 200-yard outings. Gallup currently ranks fourth nationally in receiving yards and receiving yards per game and third in receptions per game. He also leads the FBS in receptions of 10-plus yards. Gallup, a liberal arts major, was also a first-team All-Mountain West honoree last year. Stevens leads the MW in passing yards (3,479), passing yards per game (289.9) passing touchdowns (27) and total offense (301.5). His 27 passing TDs are the second-most in a single season by a CSU quarterback, while his yardage total ranks third in program history. He has thrown for more than 300 yards on seven occasions this year and has multiple touchdown passes in 10 games. Stevens ranks 11th nationally in passing yards and 12th in touchdowns. Stevens was a second-team selection as a sophomore in 2015, then earned honorable mention all-league honors last year. The Murrieta, Calif., native is pursuing his master’s degree in tourism management. Dawkins has 1,349 rushing yards and 1,675 all-purpose yards this year, cementing his reputation as a versatile weapon for the CSU offense. Dawkins has feasted against league foes, rushing for over 100 yards in seven of eight MW contests. His top rushing output of the year came against Nevada on Oct. 14, running for a career-high 191 yards. The Louisville, Ky., native and sociology major is being honored by the MW for the first time. Colorito and Watson have been standouts for the CSU defense this season. Colorito’s 11 tackles for loss rank sixth in the MW, while Watson leads the Rams and ranks in the top 10 in the league with 103 total tackles. Fackrell ranks second among MW tight ends with six touchdown receptions. Moxley has been a key cog on the CSU offensive line, starting at three different positions this year (left tackle, left guard, right guard). Stonehouse has been one of the top freshman punters in the nation in 2017, with 17 punts of at least 50 yards, 20 that have been downed inside the opponents’ 20-yard-line and a gross average of 46.8 yards per attempt. The awards are determined by vote of the league’s coaches and media who cover MW teams. CSU is headed to its fifth consecutive bowl appearance and will learn its postseason destination on Sunday.